Oy vey. My delinquency quotient is at an all-time high. No posts for months and, meanwhile, I’m busily taking photos of nearly every meal I consume and, subsequently, not sharing them with you. It’s a disgrace. You shouldn’t take it. Here are select highlights from the last month-and-a-half of eating. Where’ve you dined and liked lately? Hot damn, this place is good. Been twice in three weeks and I live nowhere near it. Gaijin means foreigner in Japan. My brother-in-law, who’s in the Navy, recalls the unwelcoming response his Americanness stoked when entering certain restaurants in Tokyo. The staff would raise their arms to their chest in a firm X and yell, “Gaijin!” He was forced to exit. San Diego’s Gaijin is far more welcoming, playfully named by chef/owner Antonio Friscia, who is neither Japanese nor full of the hubris these Tokyo folks espoused. A few favorites: green tea soba noodles bathed in uni butter; bao buns (I fondly call them bao chickee bao-bao buns); quail egg and bacon yakitori; and miso black cod yakitori, which patiently marinates for three days (Friscia says two isn’t quite enough). 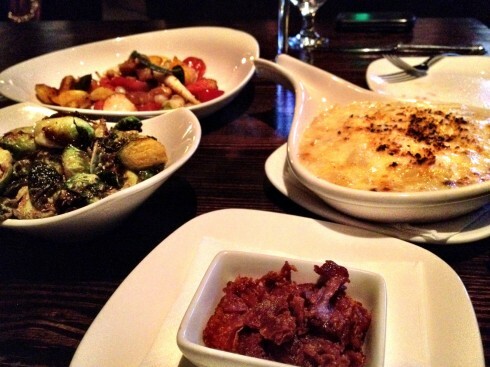 All meat on the menu comes from humanely raised animals and the produce from area farms. And the libations? Try the black sesame snow cone, a concoction by the ever-talented Snake Oil Cocktail Co. boys, served with a half-shot of smooth, unfiltered sake to be poured over the top. 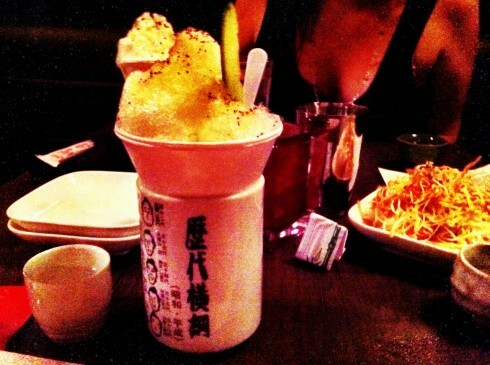 The cucumber snow cone’s excellent, too, bringing to mind a spa day — with sake. Cucumber snow cone by Snake Oil Cocktail Co.
Second time at this Nepalese treasure on La Mesa’s main drag. The first was with the hilarious David Moye, Weird News columnist for The Huffington Post, and local publicist Sandy Young. Second was with the hubby. 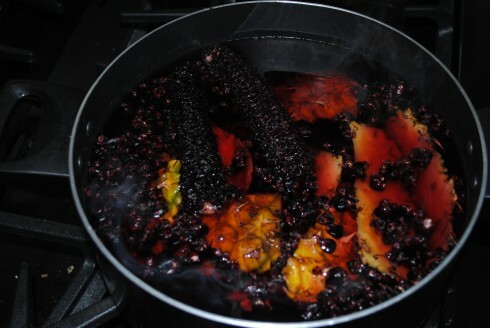 The food, drawing from the culinary traditions of Nepal and India, is similar to the Tandoor Indian cuisine common in San Diego (some better than others), but with a few different spice profiles. The late Naomi Wise, food critic for the San Diego Reader, used to tell me about her time in Nepal, so it seems appropriate to honor her memory with her 2009 review of Himalayan Cuisine, a positively captivating read. 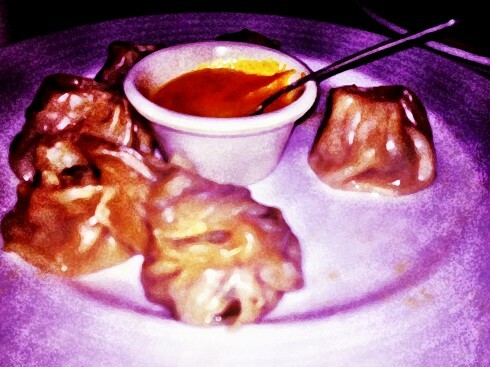 One to try: Chicken Momo (8 pieces for $9.95). These steamed dumplings, pictured below, are filled with minced chicken, onion, cilantro and a pleasing blend of other spices and served with a delicious Himalayan sauce. They made me think of the Xio Long Bao (pork and broth-filled dumplings) at the beloved Dumpling Inn in Kearny Mesa, only (shhh) I found them more pleasing. A dark dining room made for bad photo quality, so I had to do some artsy camera Kung Fu to kinda salvage the aesthetic integrity of the dish. I recently took a trip to visit Mary, a dear old friend who bought a cute Craftsman-style fixer-upper in Pasadena. After a productive day of catching up, choosing flooring and planning meals for the 24 hours I’d be in LA, we settled into Haven Gastropub for dinner. Mary knows I write about food, so she was cautious with her dining recommendations. Haven was a hit. The folks being Haven Gastropub source their meats from ranchers that practice humane animal husbandry and the produce comes from local farms. My friend is a peseceterian, so I suggested we split several dishes that conform to her dietary standards. We began with a remarkable Hiramasa (yellowtail amberjack) Crudo with pink grapefruit and moved on to the Vegetable Mélange: roasted baby beets, white carrots and other seasonal vegetables; pumpkin gnocchi; toasted pumpkin oil; fried sage and smoked sea salt. I love how the dish entails roasting, toasting, frying and smoking (but not that kind of smoking, though I’m sure some choose to complete their meal that way). This was a real treat. We also delighted in a stunning mac ‘n cheese (it takes a pretty special mac ‘n cheese to stun me these days) with black truffles, gruyere, fontina and parmesan and delicious roasted Brussels sprouts, drizzled with lemon juice (and perhaps a lotta butter) and prosciutto from Zoe’s Meats, served on the side. Fun learning about LA artisans after immersing myself in the slow food world of San Diego.